Let’s Go Back. Way Back. In the 1960s, our founder and president, Gary Olsen, pursued his passion for motorcycles with his business called Sports Cycle Sales and became the largest retailer of Hodaka motorcycles in the Intermountain West. His vision for a sales and distribution business model has lasted for decades. 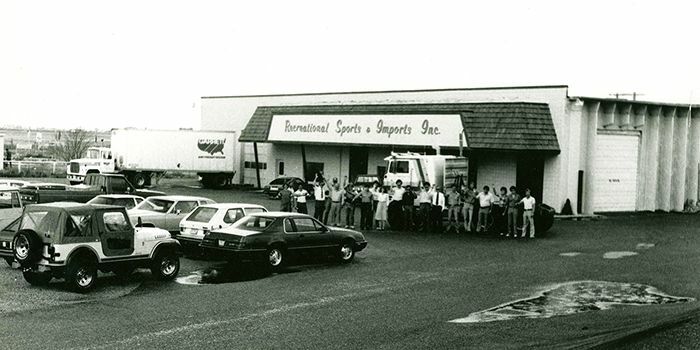 As of 1970, Gary incorporated his business under the name Recreational Sports and Imports - which is why we are now known as RS&I, Inc. During that time, RS&I included a full line of recreational vehicles with Sno-Jet and Kawasaki snowmobiles, Glastron and Tahiti boats, plus related accessories. 1979 rolled around and RS&I was introduced to the new technology TVRO (Television Receive Only) and we began to sell dish antennae to local farmers. This was a big move – and so were the antennas. The future of RS&I was well positioned as we established ourselves in the satellite industry. In the early 80s, RS&I was well grounded in the emerging satellite TV / C-Band industry and we became one of the largest distributors of TVRO equipment in the country. After more than a decade of success with TVRO, we jumped on board the VSAT (very-small-aperture terminal) antenna revolution as the first distributor to contract with Primestar, an emerging mini-dish service provider. 1999 was another huge year for RS&I. Primestar was purchased by DirecTV and we became known as the nation's largest distributor for the DirecTV Authorized Dealer program. On top of that, we began offering the HughesNet Authorized Retailer program – which sells high-speed Internet via satellite. DISH Network came into view in 2004 when we transitioned from DirecTV. As a result, RS&I became the nation’s largest DISH distributor, providing the DISH Authorized Dealer program to thousands of new and existing businesses. And we’re still going strong! Since 2008, we’ve added authorized dealer programs for excellent services from CenturyLink and RingCentral. Dealers can even get TVs from Sony and LG to go along with the other services as a package deal. The Authorized Vivint Retailer program has been our latest addition in 2014. Now our dealers can enter the home security and automation market with minimal upfront financial investment, one of the high-priced insurance often associated with security sales, and no need to hire and train installers. In the End – What Can We Do for You? In addition to all of the sales and distribution services for these authorized dealerships, we facilitate one-on-one service, retailer certification and training, online business management tools and marketing support. We also provide fulfillment and installation services for our corporate partners throughout the western half of the United States. You can add or start a legitimate business, with a wide variety of options, when you team up with RS&I. And we’ll be there to help you succeed. Whether you are an established company in need of professional sales and distribution services, or an independent retail business wanting to expand your business, a partnership with RS&I may be a perfect fit for you!